Raymond H Wolford, Head, male, white, 30 years old, married, attended school through H-2 (sophomore year), born in Kansas, on April 1, 1935 lived in Topeka, Shawnee, Kansas, works 44 hours a week as a stock clerk in a department store, worked 52 weeks in 1939. Caroline Wolford, Wife, female, white, 29 years old, married, attended school through H-1 (freshman year), born in Kansas, on April 1, 1935 lived in Topeka, Shawnee, Kansas. Does not work outside the home. Betty Jane, Daughter, female, white, 8 years old, single, has completed 2nd grade, born in Kansas, on April 1, 1935 lived in Topeka, Shawnee, Kansas. Barbara Jean, Daughter, female, white, 8 years old, single, has completed 2nd grade, born in Kansas, on April 1, 1935 lived in Topeka, Shawnee, Kansas. This is the family of my grandmother Barbara Jean, her twin sister Betty and their parents Raymond and Caroline. My grandma and her sister recently celebrated their 81st birthdays. My great grandma Caroline Porubsky Wolford lived until 2003 and although she lived most of her life in Topeka, Kansas, I was fortunate enough to have met her several times. The only other great grandparents alive in my lifetime were my great grandfather Francis Witt (who died in 1992) and his wife Helen Bixler (who died in 1985). I have to admit that when I found this record, I was surprised that it was a Denver census record. I have vague recollections of my grandmother saying she lived in Denver, but I spent hours scouring Topeka, Kansas for her 1940 census record. An Ancestry.com hint led me to Denver. It sounds like I have some questions to ask at Christmas! 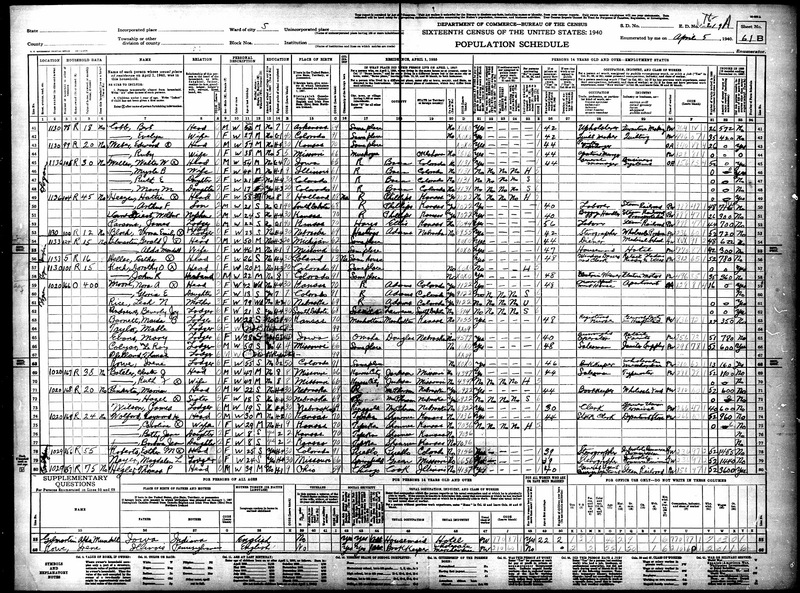 1940 U.S. Federal Census, Denver County, Denver, population schedule, Enumeration District 16, Sheet 61B, Dwelling 169,. Raymond H. Wolford; digital image, Ancestry.com (http://www.ancestry.com : accessed 30 September 2012), citing National Archives microfilm publication Roll T627_490. ← Shopping Saturday: Free Milkshake!